GOES-17 (GOES-West) “Red” Visible (0.64 µm) and Low-level Water Vapor (7.3 µm) images (above) showed a northeasterly flow (model analyses) off the coast of British Columbia, Canada on 25 March 2019. Contained within this offshore flow was a hazy plume moving over Haida Gwaii and out across the eastern Pacific Ocean. This aerosol plume was more easily seen in GOES-17 True Color Red-Green-Blue (RGB) images from the AOS site (below). In comparisons between VIIRS Visible (0.64 µm) and Day/Night Band (0.7 µm) from Suomi NPP at 2104 UTC and NOAA-20 at 2154 UTC (below), the portion of the plume where aerosols were most dense (and therefore more reflective) was better portrayed in the Day/Night Band images. Similarly, the portion of this plume having a higher aerosol concentration was highlighted using Terra MODIS Near-Infrared “Cirrus” (1.61 µm) imagery (below). The corresponding MODIS Water Vapor (6.7 µm) image showed that while the plume was generally contained within a ribbon of drier air, a narrow tongue of moisture existed within the core of the band of dry air. Both the VIIRS and the MODIS imagery indicated that the plume was passing over Sandspit (surface identifier CYZP), where the surface visibility briefly dropped to 7 miles at 21 UTC during a short period of northwesterly winds. A toggle between the 2015 UTC Suomi NPP VIIRS True Color RGB image and Aerosol Optical Depth product as viewed using RealEarth (below) also showed the plume was passing over station CYZP on Haida Gwaii. Note that there were a few VIIRS fire detection points (red dots) in central British Columbia — which suggests that this aerosol plume was likely smoke from biomass burning. Regarding the moisture gradient seen on the MODIS Water Vapor image, it is interesting to examine 3 adjacent closely-spaced NUCAPS soundings immediately south of CYZP (below). The Total Precipitable Water values increased from 0.18″ to 0.26″ within a distance of only 60 miles. 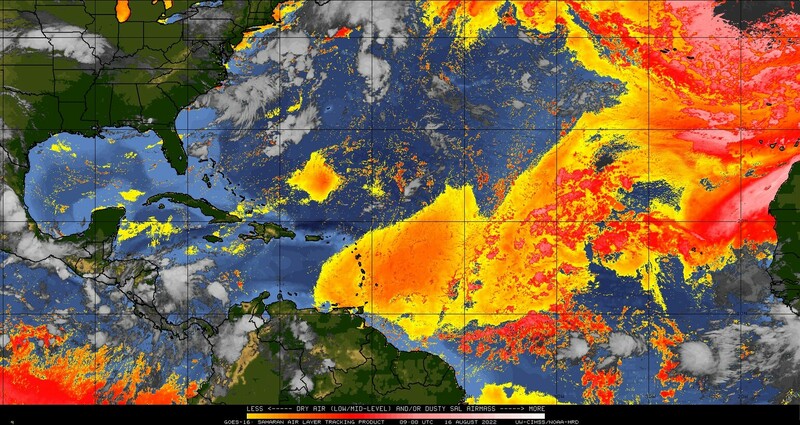 A Saharan Air Layer (SAL) outbreak is occurring over the eastern Atlantic Ocean on 11-12 March 2019. The animation above shows the Split-Window Difference (10.3 µm – 12.3 µm) (link, from this website) color-enhanced to accentuate in red/pink/white the regions where Saharan Dust has been lofted into the atmosphere. This outbreak has been developing — this animation (courtesy Arunas Kuciauskas, NRL in Monterey) from 0400 UTC on 8 March to 1400 UTC on 11 March of the DEBRA product (now the Dynamic Enhanced Background Reduction Algorithm, from this website) shows the dust originating west of a departing cyclone over northwest Africa). NUCAPS Profiles sampled a region of the SAL on Tuesday 12 March, and those are shown below. (This has been discussed previously on this blog, here) The swath of points is shown on top of a GOES-16 Red/Green/Blue image composite designed to highlight dust in pink. Sounding locations shown are denoted by the orange dot, and Precipitable Water associated with the sounding is indicated. The accentuated mid-level drying associated with the SAL air, inferred by the pink in the RGB, is readily apparent. The animation above and the one below are courtesy Arunas Kuciauskas from the Naval Research Lab in Monterey CA. The Dynamic Enhanced Background Reduction Algorithm (DEBRA) dust product animation, above, is a product developed at both NRL and the Cooperate Institute for Research in the Atmosphere (CIRA) by Steve Miller. DEBRA was derived from the MSG SEVIRI dataset. The background is gray-scaled to enhance the yellow-shaded lofted dust. Brighter yellow shades suggest greater confidence that a pixel is dusty. The animation below shows output from the ICAP model; this is an Aerosol optical depth (AOD) prediction model that was initialized with data from 0000 UTC 11 March 2019; it provides 6-hourly forecasts of AOD (colored contours) through 0000 UTC on 16 March 2019. This ICAP Multi Model Ensemble (ICAP MME) is a consensus style 550 nm aerosol optical thickness (AOT) forecast ensemble from the following systems: ECMWF MACC, JMA MASINGAR, NASA GSFC/GMAO, FNMOC/NRL NAAPS, NOAA NGAC, Barcelona Supercomputing Centre NMMB/BSC-CTM and UK Met office unified model. Suomi NPP overflew the leading edge of the SAL in the eastern Atlantic around 1500 UTC on 13 March 2019. The animation below shows the NUCAPS points superimposed on the GOES-16 Baseline Total Precipitable Water Product (very dry air is indicated) and on the Dust RGB that highlights the SAL in Red. Additionally, 6 NUCAPS Soundings are shown. They captured the very dry air associated with the SAL. Total Precipitable Water estimates from the GOES Baseline Product and from the NUCAPS sounding are indicated. The GOES moisture estimates are heavily constrained by GFS model data as the Advanced Baseline Imager (ABI) has only 3 infrared bands (at 6.19 µm, 6.95 µm and 7.34 µm, Bands 8, 9 and 10) that are sensitive to water vapor. In contrast, the Cross-track Infrared Sounder (CrIS) on Suomi NPP has many more bands that are sensitive to Water Vapor. More than 60 are used in the NUCAPS retrieval.